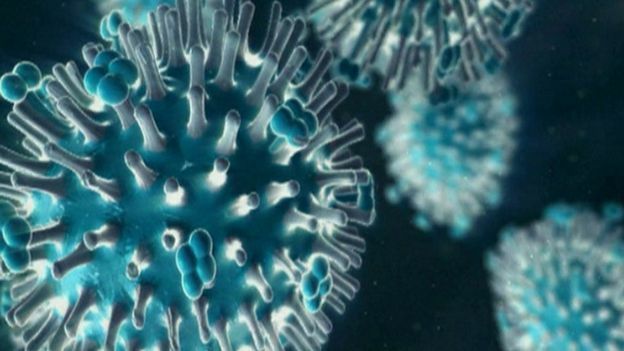 KIEV, Ukraine -- Ukrainian officials have introduced a number of urgent measures to head off an outbreak of swine flu in the country, such as temporarily closing schools and banning some public gatherings. The swine flu virus - H1N1 - can be fatal. The Kiev city government has introduced a compulsory "mask regime" for its workers. So far, the virus has killed 60 people, and is approaching, or has reached, epidemic levels in parts of the country - including the eastern Donetsk region, where fighting continues against Russian-backed insurgents. Still, health authorities insist there is no reason for undue concern - an outbreak of swine flu was anticipated for this winter. The measures are primarily "prophylactic," they say, in order to prevent the disease from growing into uncontrollable levels. "There is no reason for panic," Alexander Kvitashvili, the country's health minister, said on Tuesday. "Ukraine is in the same situation as its neighbours in Central and Eastern Europe." Still, the disease seems to have caught Ukrainian officials flat-footed. And the number of fatalities, which has surged in the last week, is a cause for worry. "From the point of view of doctors, the situation is serious," said Dr Fyodor Lapiy, Kiev's chief immunologist. "The number of cases of sickness are growing, and very many young people have fallen ill."
According to Dr Lapiy, one of the main reasons for the increase is the lack of a "culture of vaccination" among both doctors and the general population. The number of physicians recommending to their patients to be immunized is extremely low, and the percentage of those who have actually received their flu shots is "practically non-existent," he says. Another factor contributing to the seriousness of the outbreak is that many people do not seek treatment until the flu has progressed to an acute - and difficult to treat - stage. "I encourage all people who suspect they have the flu, whether it is actually the flu or not, to go immediately to your physician," said Health Minister Kvitashvili. Also, needed equipment, such as respiratory devices or surgical masks, are in short supply - or are misused. However, this instance of swine flu also points to deeper and more chronic problems within Ukraine's health system. Seemingly, every outbreak of a major illness unleashes a panicked response, or at least a widespread scrambling, among health officials. Last year, authorities launched a nationwide emergency polio vaccination campaign, after two children died from the virus in south western Ukraine. At the heart of the problem lies a health system that requires major re-structuring and is rife with corruption. Doctors are grossly underpaid, and graft touches everything from the availability of treatment, to the supply of medications. Complicating matters, parliament deputies failed to pass a major health reform package before leaving for vacation at the end of last year. According to Dr Lapiy, Ukraine differs from its neighbours in significant ways. In contrast to European countries, trust in the health system is extremely low, which is common among post-Soviet states. But Ukraine is more democratic, and chaotic, than most countries in the former Soviet Union, and therefore lacks a central authoritarian structure that allows decisions to be taken quickly and decisively, when needed. This is best exhibited by the fact that the country has seen four health ministers in the last two years, he says. "To sum it up in one word, what we lack is 'continuity'," he says.